The first image of Black hole was released by Event Horizon Telescope last evening. The scientific breakthrough of the first-ever image of the center of the Milky way galaxy was possible because of a graduate student named Katie Bouman. Bouman developed a special algorithm which made it possible to capture the orange flaming ring surrounded by dark. It took more than 2000 researchers and about 8 radio telescopes all imagine together and piecing the data together to develop this image. Bouman developed a very crucial algorithm to make this image possible. The First Image of Black Hole Gets Welcomed With Funniest Memes and Jokes on the Internet, Check Hilarious Tweets. Black holes are extremely far away and Bouman had compared clicking their picture to clicking an orange on a moon, from the earth. Katie Bouman is an MIT graduate and she has been working on this project for a few years. She directed the verification and selection of the parameters for the data from the telescopes. "We developed ways to generate synthetic data and used different algorithms and tested blindly to see if we can recover an image," she told CNN. Bouman had given a TED Talk about capturing the Black Hole and the difficulties involved. First Photos of Black Hole Released! Watch Video With Images of Black Hole Found in Galaxy Called M87. 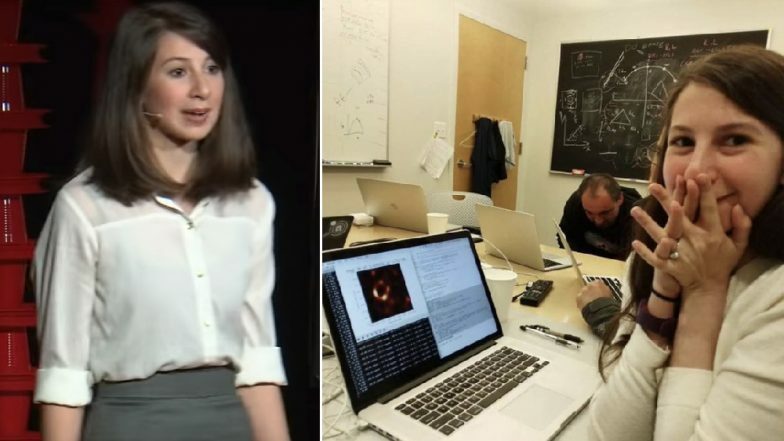 Ever since the first picture of the black hole was released, a picture of Katie Bouman looking all happy that her efforts paid off has been shared widely on Twitter. Everyone is appreciating her work and really happy with the contribution for the moment in history. Katie deserves all the praises for her amazing work. It is also amazing to see a woman helping achieve great heights, creating history in itself, in the field of science.